Colchicine for gout is not a permanent solution. It isn’t even a temporary solution, but it can be extremely effective at bringing short term gout pain relief. Why do I say that short term gout pain relief is no kind of solution for gout? Because it should never be used to help gout pain in its own right. It should only be used to allow uric acid lowering treatment programs to be effective. TL;DR? See Colchicine For Gout key points for a quick overview. Colchicine Storage & Shelf life. Colchicine For Gout Key Points. 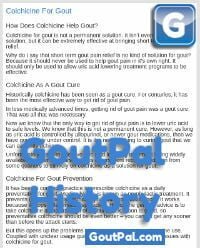 Historically colchicine has been seen as a gout cure. For centuries, it has been the most effective way to get rid of gout pain. In less medically advanced times, getting rid of gout pain was a gout cure. That was all that was necessary. Now we know that the only way to get rid of gout pain is to lower uric acid to safe levels. We know that this is not a permanent cure. However, as long as uric acid is controlled by allopurinol or newer gout medications, then we have gout firmly under control. It is the nearest thing to curing gout that we can currently achieve. Unfortunately, despite effective uric acid treatment being widely available for over 40 years, there is a persistent recommendation from some quarters to still rely on colchicine as a solution for gout. It has been a common practice to prescribe colchicine as a daily preventative for gout. Medically, this is known as a prophylactic treatment. It prevents (or dramatically restricts) gout pain from taking hold. It works because it stops inflammation spreading. Hence the general advice is to take colchicine at the first sign of a gout attack. Soon is good, so preventative colchicine should be even better – you cannot get any sooner than before the attack starts. But this opens up the problems of reactions to long-term colchicine use. Coupled with unclear usage guidelines, there have been many issues with colchicine for gout. Recently, poor colchicine prescribing practices have led to generic colchicine being replaced by Colcrys in the United States. It is exactly the same active ingredient, but dosing guidelines are much clearer. Unfortunately, they still include using colchicine for gout flare prevention (prophylaxis) without making it clear when prevention is justified. Recent Colcrys dosage research reveal that this is still allowing massive overuse of colchicine, at a significant cost now it is Colcrys. Yes, it is correct to use colchicine for gout flare prevention, but only if the underlying problem of excess uric acid is being managed properly. Therefore, the correct use of colchicine for gout is to use it during the early stages of uric acid treatment. The early stages mean the weeks or months that it takes to stabilize uric acid at 5mg/dL (0.30mmol/L) or below. This will vary enormously from patient to patient, so it must be managed on an individual basis. In my case, I was advised to take colchicine as a preventative for 2 weeks when I started allopurinol treatment, and again when the dose was increased. This was very effective for me, and I found that I could manage with one week after the third allopurinol increase. I was also advised to keep colchicine on-hand to take at the first sign of a gout flare. I needed to do this on a small number of occasions, and I never suffered any serious pain. When you take colchicine as a preventative, your doctor should advise you when you can stop taking it. But, as far as I know, there are no general guidelines for how long preventative colchicine should last. So, I consider the logic, which tells me you should continue until the risk of a gout flare is acceptable. Unfortunately, we can never say with absolute certainty that you will never get another gout flare. But if you have gone six months with uric acid under 5mg/dL and without a gout flare, it is extremely unlikely that you will get another flare. So, in that situation, you can stop taking colchicine. Importantly, this is a personal decision for you to balance the risk of a gout flare with the inconvenience of taking colchicine. For example, if you are starting a new job, or going on vacation, you might be more fearful of a gout attack than normal. Firstly, discuss your concern with your doctor, and get their opinion on restarting preventative colchicine. Assuming your doctor agrees, I recommend restarting colchicine a few days before you need to. Because the last thing you want is stomach problems with that new job or vacation. Also, if you normally support colchicine with other gout pain relief during an attack, you should get a prescription for those. Then, when your critical period has finished, simply stop taking your preventative colchicine and return to normal life. Many gout sufferers ask how to store colchicine and how long it lasts. Because Colcrys is expensive, or because colchicine taken as required might not be needed for a long time, these are important questions. • Do not take Colchicine Tablets after the expiry date which is stated on the label. The expiry date refers to the last day of that month. • Do not take Colchicine Tablets if you notice that they are showing signs of deterioration such as discoloration. • Store in the original package in order to protect from light. Three years in polypropylene or polyethylene tablet containers. Two years in strip packs of opaque white or clear PVC film and 20µ aluminum foil of 10 or 14 tablets. If you are taking colchicine for gout without a uric acid treatment program, or beyond the first few months, you must see your doctor immediately. Once uric acid has stabilized at 5mg/dL or below, there should be no need for colchicine. If you are still experiencing joint pain, it should be investigated by a rheumatologist. Colchicine helps block gout pain. But, also lower uric acid or you get no gain. Leave Colchicine For Gout to read other Colchicine pages. Summary of Colchicine Characteristics (archive September, 2017). Colchicine UK Product Label PDF. Do you have suggestions for improving Colchicine For Gout? Then, please share your idea on GoutPal’s Forum. Or, send the Feedback Form, below. Colchicine is not a gout cure. Colchicine is best as a preventative when you start to lower uric acid. Need more help? Then get personal gout treatment help from GoutPal.